Making home modifications such as installing residential lifts or elevators can provide peace of mind and flexibility for those who want to stay in their homes after a loss of mobility, strength or agility. 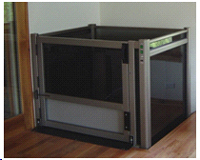 However, the quality of the installation can affect the safety of the people who use them. That's why it's important to take the necesary steps to ensure the work is done properly. Where can I purchase the device I need? What questions should I ask before I buy? What if I want to buy a used device? Can you trust the contractor/installer? Do you need a building or electrical permit to install your device? Should I have the installation inspected or certified? What is the recommended maintenance schedule for my device? Although Technical Safety BC does not directly regulate the installation of these devices, the manufacturing, installation and maintenance of the devices must be completed according to Canadian Standards Association code to ensure the safety of users. The design of a lift or residential elevator installation is typically complex, involving architectural, structural and electrical elements. It is not a project to be tackled by a handyman. Start by researching local medical equipment suppliers and elevating contractors who offer lifts and residential elevators. Ask friends and professionals for recommendations and contact the Better Business Bureau to ensure the supplier is in good standing. 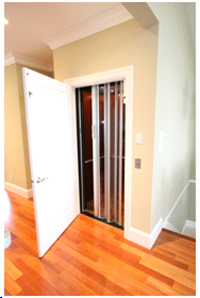 Although not mandatory, we recommend having the contractor make a home visit so they can make recommendations on the feasibility of different types of lifts and residential elevators. Most contractors offer this at no charge. If possible, also arrange for a health professional such as a physiotherapist or occupational therapist to be present for the site visit. They can help ensure that the type of device being recommended will meet your current and future needs. You can purchase elevating devices from a general or elevating contractor, or from one of many local medical equipment suppliers. Ensure the product is manufactured to the correct safety codes listed above. What questions should I ask before buying a device? Do I want to purchase new or used? If I am purchasing a used device, how can I ensure that it is safe to install/use? Is the device manufactured according to the most recent Canadian codes? What are the safety features of the device? Will I need a building or electrical permit to install the device? Is the contractor or subcontractor I hire licensed and/or experienced with this type of installation? Some used devices can pose a safety risk. Always have the device inspected by a licensed contractor before you purchase or install it. Use our Find a Contractor tool to find a certified elevating contractor in your area. What are the safety features of your device? Operation Controls: All lifts are required to have constant pressure controls, elevators can have one touch controls. It is dangerous to have automatic operation on unenclosed platforms and lifts. 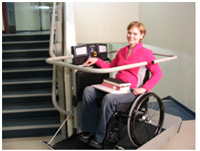 Stopping Devices: The lift should be equipped with stopping devices to stop the lift at landings and in some cases when the lift travels beyond its normal landings. Safeties: Safeties stop the lift and holds it in position in the event of suspension or drive failure. Ascending car protection is required in addition to safeties on “Traction Drive Units”. A manual lowering or raising system: This is necessary in case of a power outage or a mechanical malfunction. An emergency battery backup system is also a good option. Safety Edges/Surfaces: Where potential shearing (cutting), crushing, trapping or abrading hazards exist, the lift should be equipped with safety edges, surfaces or sensors. This will stop the lift if any obstructions are encountered. Safe Platforms: Including handrails, adequate lighting, emergency backup lighting and a smooth platform surface that is free of tripping hazards. Communication: An emergency telephone or other communication system in case of emergency or entrapment. General Design: The equipment should be designed in a way that protects the user and anyone nearby from falling, tripping, physical shock, electric shock and fire. Obtaining a trustworthy contractor/installer is just as essential as purchasing a safe device. The following are steps you can take that will help ensure you have the right person for the job. Ask for estimates from at least three different suppliers/contractors in order to assess a reasonable charge for installation. Check into the credentials of the seller, the manufacturer and the installer by asking for letters of recommendation or checking their status with the Better Business Bureau. Ask them to explain how their products comply to the related Canadian Standards code (the code that relates to the type of device you are installing). Do you need a building or electrical permit to install the device? 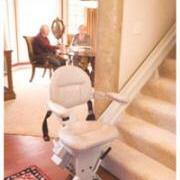 Other than for the simplest stair lift installations, you will likely need a building permit. A building permit is necessary whenever the installation of a lift or residential elevator requires structural changes to the house or affects safety systems such as stairs, fire separations, and guardrails. Electrical permits are required when any changes are made to electrical wiring in your home. Contact your municipal office and ask a building inspector about safety standards, licensing and inspection for residential lifts and elevators. Equipment Code compliance certificates for the equipment: Some manufacturers will even provide professional engineer stamped letters and drawings. Installation Code compliance certificates for installation: This letter or affidavit will ensure that the installer had installed the equipment in accordance with the manufacturer’s specifications and meets all the code requirements. Lifts and residential elevators are mechanical devices that can break down and therefore need regular servicing. Maintenance is generally complex and should be done by an expert. The manufacturer must give you a recommended maintenance schedule, which may be in the form of a manual. To ensure your device is serviced on a regular basis, you may want to consider purchasing a maintenance contract from a reputable supplier or entering into a maintenance and service contract with a contractor who has the appropriate license are good options to consider.